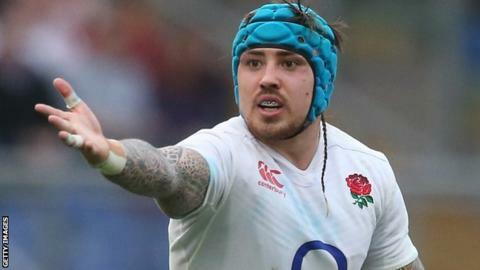 England wing Jack Nowell says they want to become "the most dominant team in the world" after completing the Six Nations Grand Slam earlier this month. The 22-year-old, who plays for Exeter Chiefs, started all five games in the championship, scoring one try. "At the start of the tournament we said that we wanted to be the best side in Europe," Nowell told BBC Radio Devon. "To do that you have to win all five games, so to come back and to achieve that is massive for us." England will take on World Cup semi-finalists Australia in a three-match series in June. "We want to be the most dominant team in the world," added Nowell. "The first stage for us was Europe and now it's going to be a massive test going down to Australia in the summer. It's going to be another challenge for us but one that we can look forward to after a good start." The Cornishman was given a week off following international duty and missed Exeter's Premiership defeat by Saracens, but is set to return to the side when they host Worcester on Saturday. "The England players have bounced out of the Six Nations on great form, and I think that's fantastic for English rugby," said Chiefs head coach Rob Baxter. "It's fantastic for this tail end of the Premiership, because you're going to see an awful lot of very good international players playing right at the top of their game." Read more on Exeter Chiefs: Why are so many Australian players deciding to move to Sandy Park?